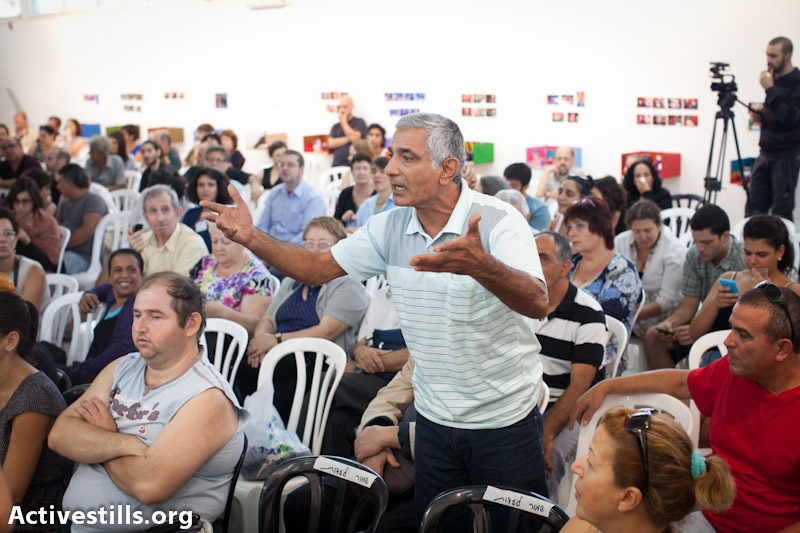 Some 150 people gathered yesterday, October 3, in the city of Bat Yam, Israel, to take part in the first “People’s Court for Public Housing.” People’s Courts are a civilian tool, used all over the world when the formal legal systems fail to provide justice for those who suffer from power relations in society. 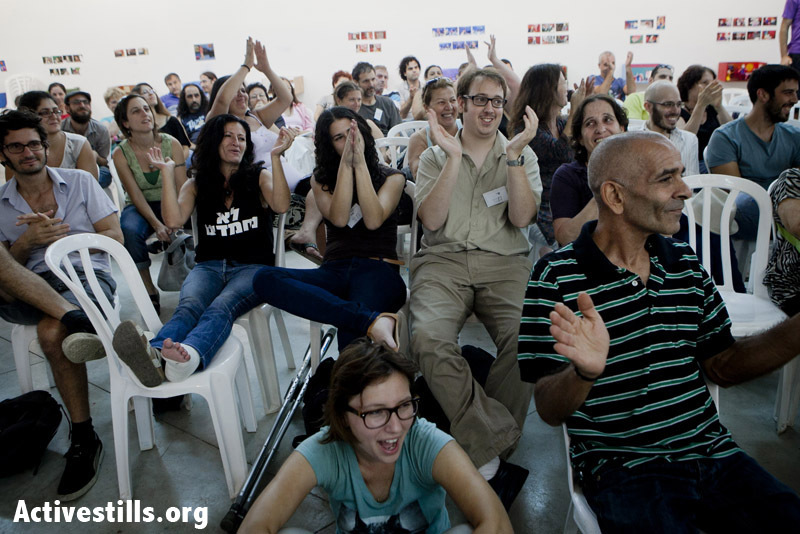 It’s the first time such a court is convened in Israel, and the defendants on trial were those responsible for the deliberate destruction of the public housing system over the past three decades. The prosecutors and witnesses in this court were victims of public housing policy from all over Israel – Jerusalem, Be’er Sheva, Holon, Bat Yam, Acre, Jaffa and more. In day to day life, public housing victims deal alone with a system designed to keep them as weak and silent as possible. Yesterday, their individual stories came together to paint a picture of systematic and deliberate abuse. “The difficult stories and the deliberate policy are brought into the light in these live testimonies. Even us, people who are familiar with these stories, find it hard to deal with what is revealed here,” said Yael Havassy, activist and expert who was one of the interrogators in court. 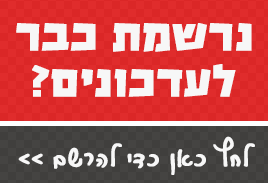 Among the defendants of the trial, who were summoned about a month ago but unfortunately did not show up to defend themselves, were Prime Minister Netanyahu, Finance Minister Steinitz, Minister of Housing and Construction Atias, and the CEOs of the public housing companies who manage most of the daily communication with tenants and candidates for public housing. 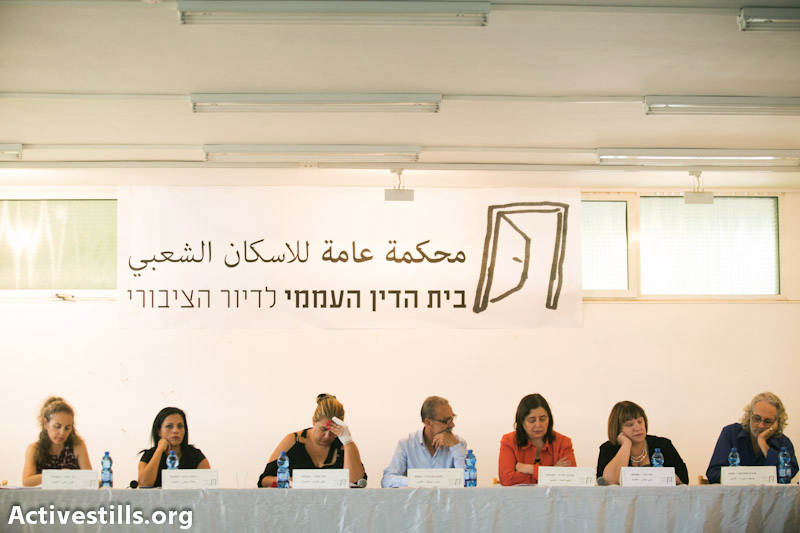 The judges were public figures, including economist and sociologist Dr. Itzik Saporta; attorney Dr. Yifat Biton; Prof. Haviva Fadia; Ruth Sinai, a prominent journalist who covers social issues; Reuven Abergel, one of the founders of Israel’s Black Panthers; and Viki Va’anunu, a long-time social activist and public housing victim herself. The format of the trial enables activists and victims-prosecutors to bring to light some of the less known aspects of the gradual elimination of the Israeli public housing system. Many stories revealed a distorted power structure, which forces a person in need of assistance to beg for the kindness of clerks and to deal with bureaucratic mazes designed for defeat. “Once a national project, the dried out public housing system, has now become a tool for systematic humiliation of people. 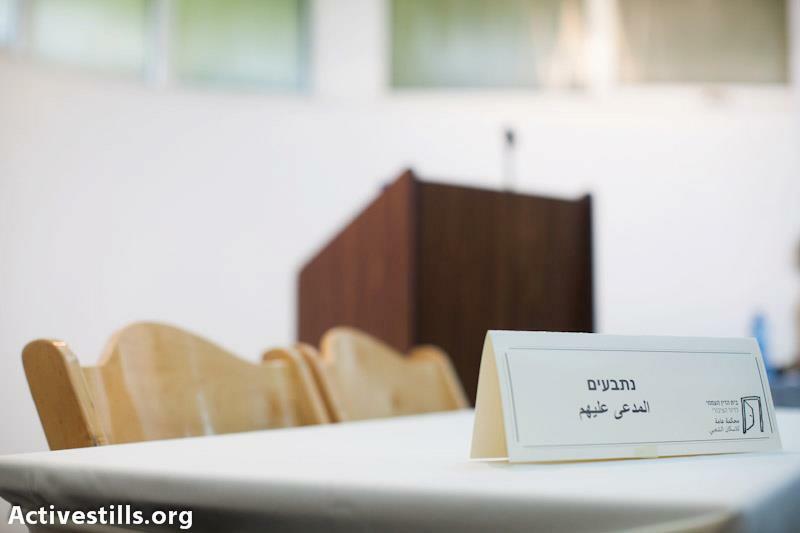 From the testimonies we heard today, it is clear that the public housing system in Israel acts in manners that can’t be defined in any other way than criminal,” said Yifat Biton. Rihani from Acre, who has been waiting for public housing for four years, told the court about the time her entitlement was taken away because the investigator who was supposed to come to her apartment mistakenly went elsewhere and didn’t find her. She lost months of the paltry financial assistance she receives because she is waiting for an apartment. The money of course was never reimbursed. Poly from Holon, who has been waiting for an apartment for five years, and lived in a tent with her three children for a year and a half, told the court how after asking several times for help at the local branch of the Housing Ministry, the guard gave her a hand written piece of paper saying she cannot enter the building or receive service for 30 days. Other testimonies revealed to the court the devastating effect of the current eligibility system: “The CEO of Prazot (Jerusalem’s public housing company) told me to have more children and then come talk to him again”, said Eti Hen, a single mother from Jerusalem. Another witness said clerks recommended she get a divorce so she could enter the waiting list. 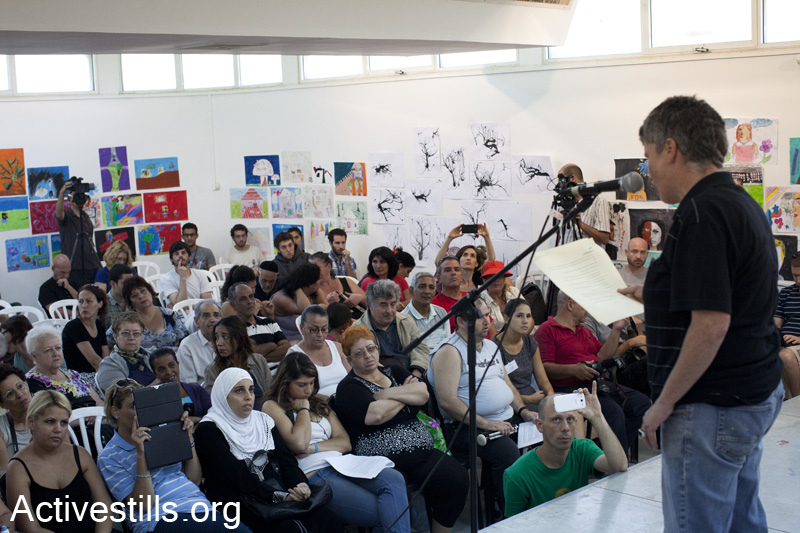 Though defendants did not show up to court and the sentence (which will be given next week) will not send anyone to jail, organizers hope the trial will be a milestone in the struggle for public housing in Israel.